Enron was an energy company. Fittingly, Louise Fischer’s production of Lucy Prebble’s play is high energy, fun and deeply thought provoking. What can you do? What have you tried. Enron asks us to question our complicity in injustice. Some of the most thought provoking speeches are delivered wonderfully by Matt Young as Enron’s Jeffrey Skilling. They ask us to question whether our society is reliant on the sort of foolish and greedy choices presented in the play to create and sustain our extraordinary wealth. And, if this is the case, isn’t it a bit rich if we only complain when the pain becomes our own. 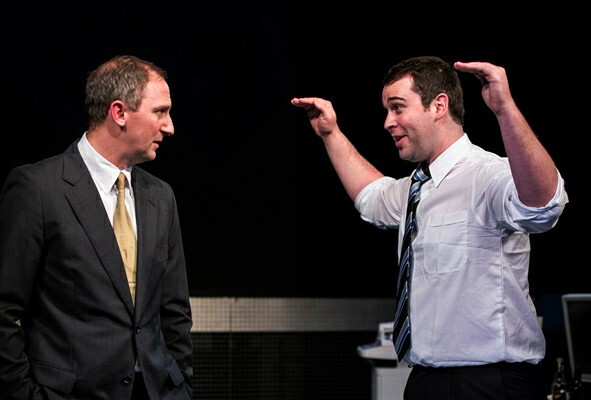 Nick Curnow gives an engaging performance as the socially awkward originator of some of Enron’s most dubious accounting practices. Hire the kids that were bullied, says Matt Young’s character, they’re hungry to prove themselves. We all want ‘in’, and only complain when we personally are excluded. Yes, there are giants that stalk the earth, but they stand on our shoulders.